An abbreviation for strengths, weaknesses, opportunities along with threats is SWOT analysis that may be known as a structured planning method for evaluating mentioned four elements of an organization, business venture or a project. Any SWOT analysis can be carried out for either a product, a place, a company, a person or an industry. Involving defining the goals of some business engagement or some project as well as identifying both the external and the internal factors that are either successful or not in order to achieve that objective. Going into details, the description of the SWOT analysis constituents are as follows: “strengths” are simply characteristics of the project or the business that make it an advantage over others, “weaknesses” are also the characteristics but those that place the project or the business at a disadvantage, “opportunities” are the elements in the environment that the business project or the business, in general, can exploit to its advantage and the “threats” are the elements in the environment that can cause trouble for the business project or the business itself. Identification of the listed SWOTs is very important as it may lead to informing the later steps in planning for achieving the objective. Those who use SWOT analysis must ask and answer many SWOT-related questions that may generate the meaningful information for each of the categories of SWOT in order to make the analysis useful, finding their competitive advantage. The SWOT and TOWS Matrix Diagrams solution can be used while working in the ConceptDraw MINDMAP as well as the ConceptDraw DIAGRAM diagramming and drawing applications allowing their users to have the easy-to-use SWOT Analysis tools for creating the professionally-looking matrices. The SWOT and TOWS Matrix Diagrams solution may be useful for many business specialists, such as state and other managers, economists, politicians, analysts, business consultants and other economic experts. There is 1 library containing 16 vector shapes in the SWOT and TOWS Matrix Diagrams solution. There are a few samples that you see on this page which were created in the ConceptDraw DIAGRAM and ConceptDraw MINDMAP applications by using the SWOT Analysis solution. Some of the solution's capabilities as well as the professional results which you can achieve are all demonstrated here on this page. This mind map was created in ConceptDraw MINDMAP, by filling in a template provided by the SWOT and TOWS Matrix Diagrams Solution. This sample has been produced by adding data to the SWOT Matrix template in ConceptDraw DIAGRAM, which is available for reviewing, modifying or converting to a variety of formats (PDF file, Power point Presentation, image or MS Visio XML) from the ConceptDraw STORE, for all users who have installed SWOT and TOWS Matrix Diagrams Solution. This diagram was created in ConceptDraw DIAGRAM using the SWOT Analysis Library from the SWOT and TOWS Matrix Diagrams Solution. An experienced user spent 20 minutes creating this sample. This sample shows a SWOT analysis diagram for a government contract. This SWOT diagram visually represents in all of the pros and cons of this contract, making it easy to come to a decision to participate or not. Use the color accents to make your diagram attractive and easy to remember. 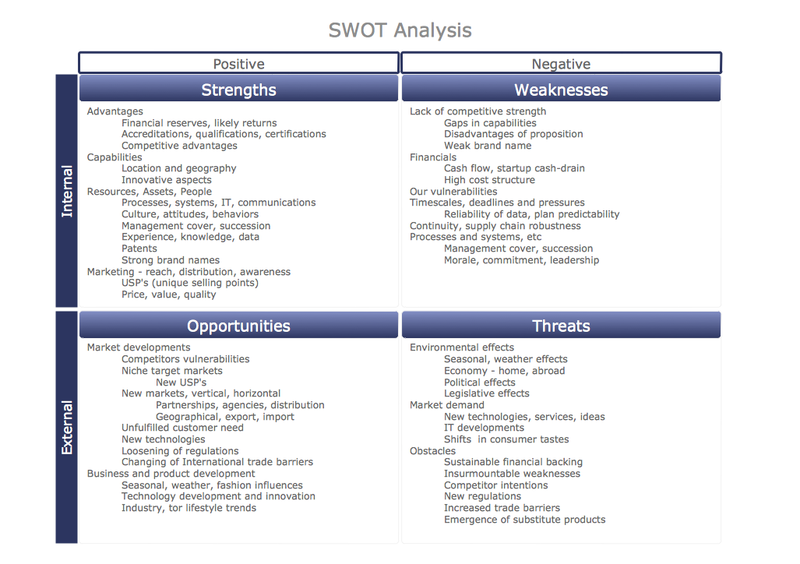 This sample shows a SWOT Matrix diagram. Use the predesigned objects from the SWOT and TOWS Matrix Diagrams Solution to make a similar bright, attractive, professional-looking SWOT diagram in just a few minutes. Both ConceptDraw DIAGRAM diagramming and drawing software and the SWOT and TOWS Matrix Diagrams solution can help creating the business planning diagrams you need. The SWOT and TOWS Matrix Diagrams solution can be found in the Management area of ConceptDraw STORE application that can be downloaded from this site. Make sure that both ConceptDraw DIAGRAM and ConceptDraw STORE applications are installed on your computer before you get started. After ConceptDraw STORE and ConceptDraw DIAGRAM are downloaded and installed, you can install the SWOT and TOWS Matrix Diagrams solution from the ConceptDraw STORE.